Walking meditation is the essence of simplicity: just pace clockwise, taking one step after each full breath. Of course, there is more to it than that — much more, if you’re a Buddhist monk who spends more than eight hours a day in silent contemplation. 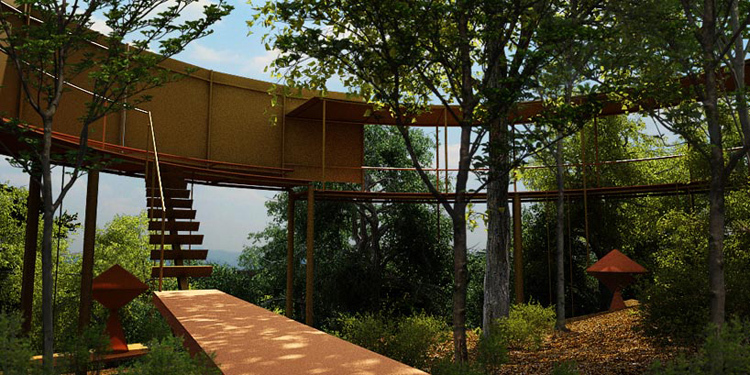 Thai architect Suriya Umpansiriratana has designed a single-monk monastery (called a “cell”) whose circular structure assists walking meditation while symbolizing the cyclic routines of the monk’s daily life. Think of it as a treadmill where you earn karma instead of burning calories. A circular walkway (painted to match the monk’s traditional robes) is divided into three equal sections, each of which are oriented towards the position of the sun that matches that portion of the monk’s daily routine. For instance, from 4 a.m. to noon, an east wall offers shade during morning chants and the daily meal. From noon until 8 p.m., a roof protects the monk from harsh midday sun. And during the final period, from 8 p.m. to 4 a.m., evening chants take place in an exposed area of the circle with a hanging mosquito net to sleep under. Combining three distinct spaces into a circular path adds a bit of variety to the monk’s hours of walking meditation. If I were a monk, I’d want to spend my days there… but then, wanting anything isn’t the way to nirvana. Which is, of course, something worth meditating on.